I had to take advantage of the BOGO 1/2 off there so my other choice was Claire's Green Confetti which packed with mega glitter in a green base. I made Suzi Skis In The Pyrenees last a day longer with it! Oh I got the glitter idea from a post by Brooke a couple weeks ago. These look great! I especially like the purple with the Konad-really pretty! this is to die for! i looove the purple w/ konad :) freaking awesome! what a hott design!! I love it! Kae, your nails are so long! This looks amazing! Oh and as for catching up - its hard. I'm saving money at the moment by staying at my desk and bringing my own lunch so I generally catch up on everyone's blogs over my lunchbreak, and write my own in the evening. It's tough though as by the time I get home from work all the Americans have got up and started writing so I have a whole host more stuff to read and comment on! I love the purple with the holo Konad. Gorgeous! I've found that when polishes run if I switch to a standard top coat and use drying drops, the problems cease. I read blogs in (what qualifies to me as) the morning with a coffee. I check again periodically throughout the day when I look at my e-mail. I haven't settled into the prefect routine yet. I used to look at the posts and comment later. Now that I read more blogs, I tend to be more successful in leaving comments if I do it immediately after viewing the post. The effect you're noticing with the purple polish might be the Seche Vite pulling the top layers of polish up towards the tips, a kind of "reverse shrinkage" that I often see on my own manicures. I really like the holo stamp, it gives the purple even more depth. Thanks, I just love stamping with holographic polishes it comes out pretty neat! Yeah I like checking in all day but sometimes you just can't do it and then waah! Haha I feel like I just filed them too, thank you. I get them stuck on my shirts and stuff, I'm due for a break soon =x I keep my nails super square so I have sharp little corners that snags on everything! What did you eat today for lunch? Sometime if I'm in a hurry with say only 15 mins, I browse quickly and comment later, but now that I follow so many blogs if I do that I sometimes forget or skip one by accident and I feel bad =x. So yeah I comment right after as well haha. The purple with the Konad is a winner for me! Very pretty. Can you seriously do your nails in 20 minutes? There is something seriously wrong with me - it takes forever. But I think I am a little OTT because any fingerprint or smudge I take off and begin again! I am very naughty with blogging, I usually have it up all day at work if work is quiet and that's how I try and keep up. It's terrible when new posts go up and I am asleep. I like to try and comment quickly but sometimes it's hard! :) Yes, I am an addict! That is a beautiful shade of purple. Love the Konad. I wish I could find a way to read faster. I am at this for hours. Once you get behind it's so hard to catch up. Once I get caught up I really have to make sure to always read. I love to comment also so it takes me even longer. By the time I get to one end of my list I'm behind on the other. Brooke does not help me by finding more blogs! Bad girl. My gosh, it that purple amazing or what? 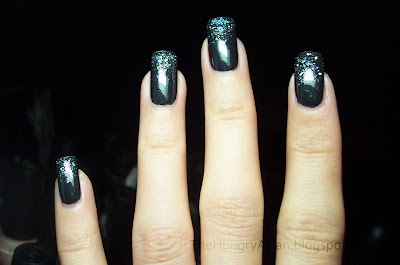 Hi Kae, your nails are so elegant and gorgeous, loved the previous dark green too! Oh where is the cute little figure with the green background? please bring it back! That is just gorgeous. Your nails and application look perfect girl! Love it! I'm behind too on everyone's blog. You're not alone...lol! Don't stress too much over it...lol! We all get busy from time to time. Oh whoops I meant I had already painted my nails in the morning and did the stamping right before dinner. I am very impatient so I dont wait between coats and just hope that Seche and hide the bubbles lol. I knew it! Prawns yum yum. You lunches sound delicious I am quite jealous! Thank you! Haha yeah I bet, I was behind yesterday and it took me an hour to read and comment (all catch-up) and I thought THAT was forever! Yeah my list grows too each week... hi Brooke! Thanks! Well now that I'm caught up it's easier to stay caught up than catch up again. lol did that even make sense?! 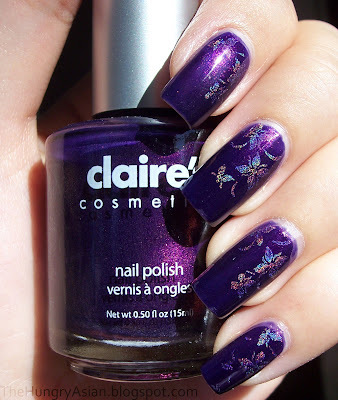 I love the purple polish and the holographic design, that was beautiful! And the glitter was very cool! I read a few blogs in the morning while sipping my coffee, a few blogs around lunch time and more when I get home. I try to stay on top of updated posts but it is tough! I really enjoy getting my daily dose of beauty from everyone! Oh the purple with holo is really gorgeous! i like how this 2 colors match. I'm still new in nail blogs here so i always get excited whenever i receive comments from all of you! I'll read and reply comments as soon as possible when i'm back from uni and have time to sit down in front of lappie.. I found that i can't leave without blogs anymore! lol.. I love this look - it's stunning! Yeah, I wish I could help about keeping up; I'm way behind myself! But there's a set order I visit blogs in (the order I discover them), so I can remember if I've been to everyone's. These last few days, though, I haven't been able to get through them all in one day, so I have to pick up where I left off the day before!